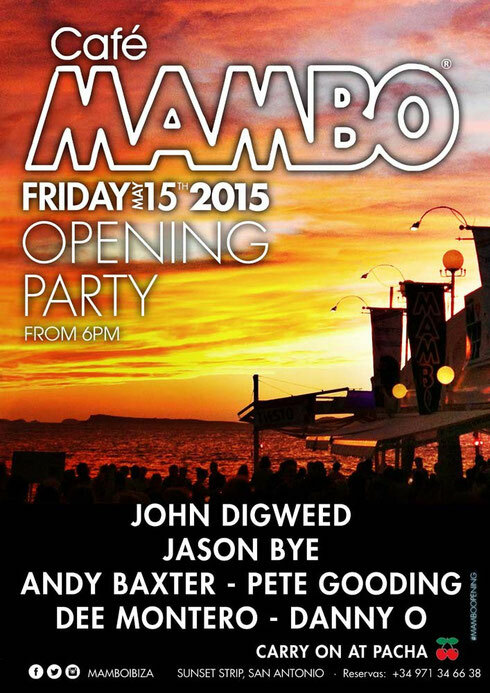 Café Mambo in Ibiza recently announced the line up for its 21st anniversary year opening party, which will feature John Digweed, Jason Bye, Andy Baxter, Pete Gooding, Dee Montero, and Danny’O this Friday 15 May. The venue will once again be hosting some of the biggest pre-parties this year, with line-ups to be announced soon. The venue has been holding parties since 1994 and hosted its first BBC Radio 1 Weekend the following year. With DJ line-ups, mixed with food, cocktails and the world famous sunset, it is estimated the outdoor area has hosted as many as 23 million passers by during its tenure. Some of the big names who have graced the decks at thie venue include Pete Tong, Carl Cox, Swedish House Mafia, Solomun, Bob Sinclar, MK, David Guetta, Duke Dumont, Martin Garrix, Hannah Wants, Guy Gerber, Tiesto, Hardwell, Fatboy Slim, Steve Aoki and many more. Cafe Mambo also hosts the annual charity event, Mambo in The Mix, whereby superstar DJs serve drinks and food while the public make donations to take turns on the decks in aid of local charities – raising over €90,000 Euros in the last three years. As a club brand, it continues to tour the world with shows in London, Dubai, Moscow, Rio Di Janeiro, Barcelona, Liverpool, Newcastle, Bali, Bahrain, Chamonix, Lugano, Copenhagen, Dublin, Glasgow, and Miami.